Indian Motorcycle Distressed Steel Sign Red. Don't hide your walls with artwork that doesn't mean anything, show off your Indian Motorcycle pride with one our many styles of Indian Motorcycle metal signs. Made especially for your order in the USA just like Indian Motorcycle. 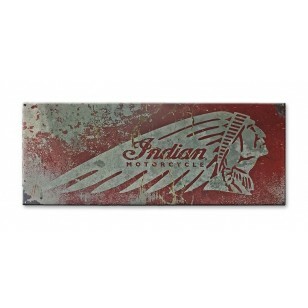 The perfect way to show support for Indian Motorcycle is with this Indian Motorcycle Distressed Steel Sign Red. 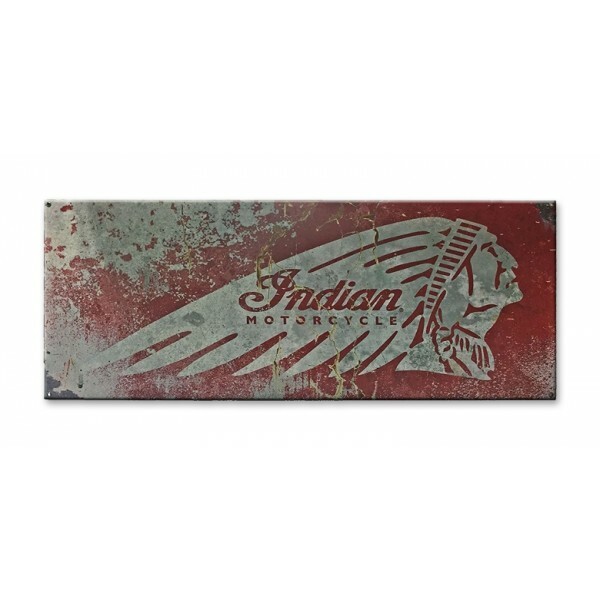 With its simple but vintage metal design, this is sure to be an eye-catching metal sign ideal for your office, garage, man cave, motorcycle club or any room in your house.This vintage-style distressed polished aluminum sign pays homage to Indian Motorcycle’s roots. The Indian logo displays a stencil-like application with distressed red paint against the silver aluminum. Whether purchasing this sign as a gift or for yourself or for a fellow rider, you can take satisfaction knowing you're buying a quality metal sign that is proudly Made in the USA.